33 year old man who presented with an ischemic stroke. There was a complete neurological recovery after thrombolysis. The ECG was abnormal with pathological Q-waves in the anterior lead and ST elevations. The echocardiographic examination is shown below. 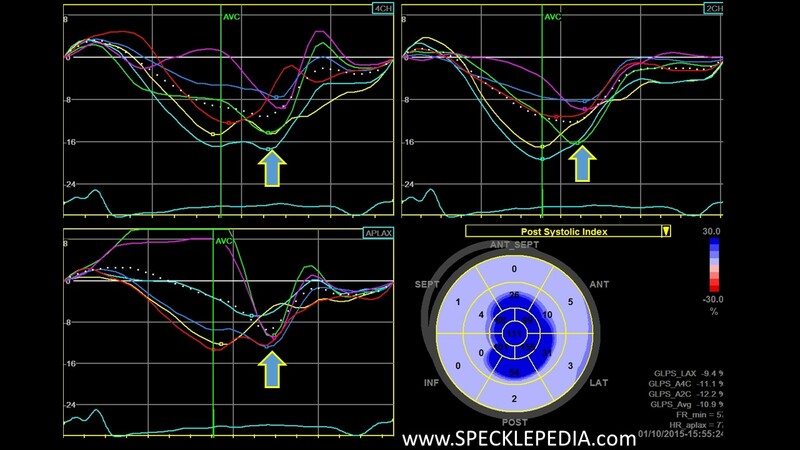 This shows clear wall motion abnormalities in the apex and midventricular region of the posterolateral wall. 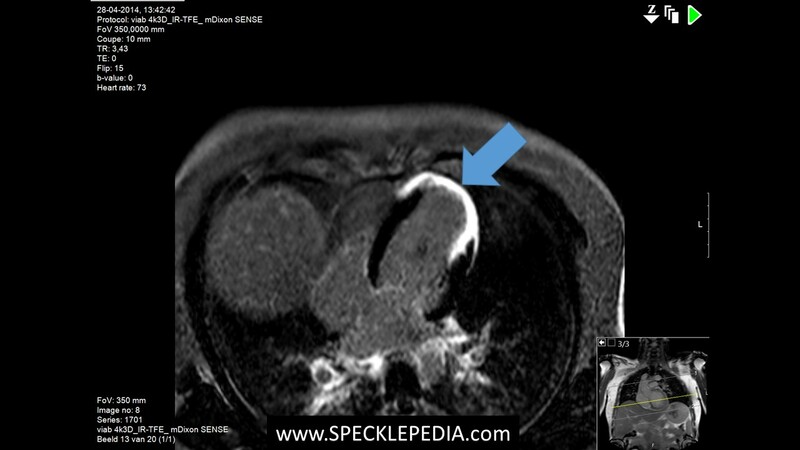 A thrombus was not seen, nevertheless most likely the cause of the ischemic stroke. Coronary angiography showed normal coronary arteries. 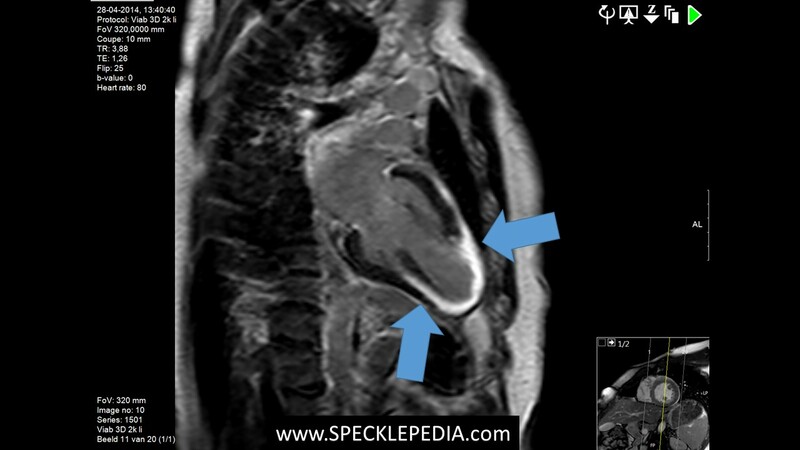 Mediastinal lymphadenopathy was seen on the chest X-ray which finally led to the diagnosis of extensive sarcoidosis disease with pulmonary, liver, bone and cardiac involvement (seen on PET imaging). 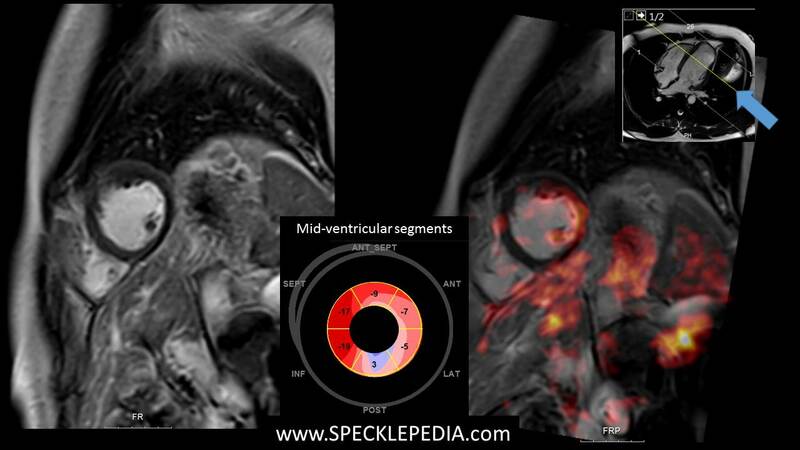 Deformation imaging in this patients shows abnormal deformation patterns (reduced peak systolic values, exaggerated post systolic shortening en very late onset of shortening / dyskinesia) in multiple regions. The apex and posterolateral regions are most affected. 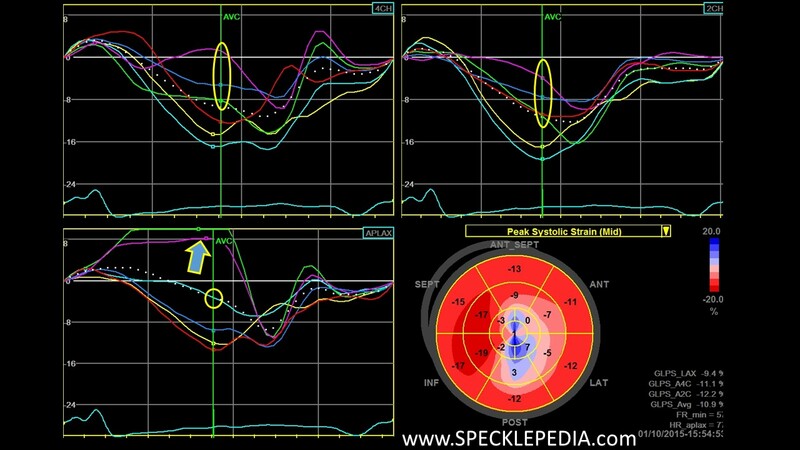 The other segments (with exception of the mid septal region) also show reduced systolic values. 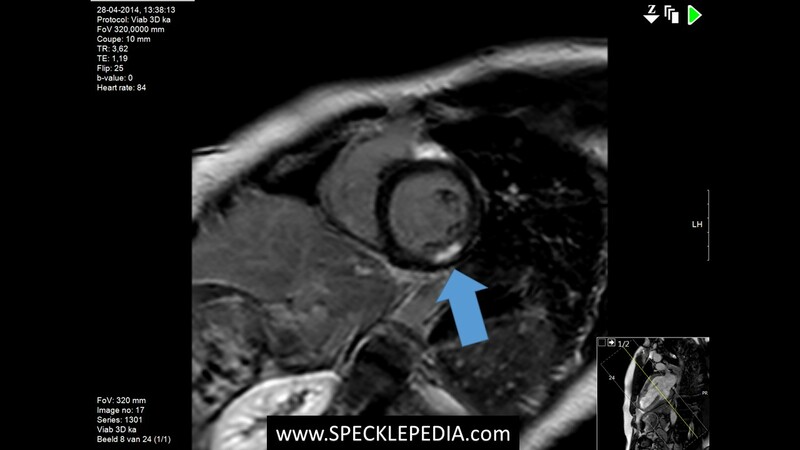 CMR showed clear transmural delayed enhancement in the LV apex and midventricular anterior and posterior. This is the substrate for the absent deformation and post systolic shortening in these segments. In the basal segments, there is no delayed enhancement detected, however, PET-imaging showed high metabolic activity in this region due to sarcoidosis. This most likely is the explanation for the reduced strain values in these segments. An MRI and an FDG-PET scan was performed in the same week in this patient. 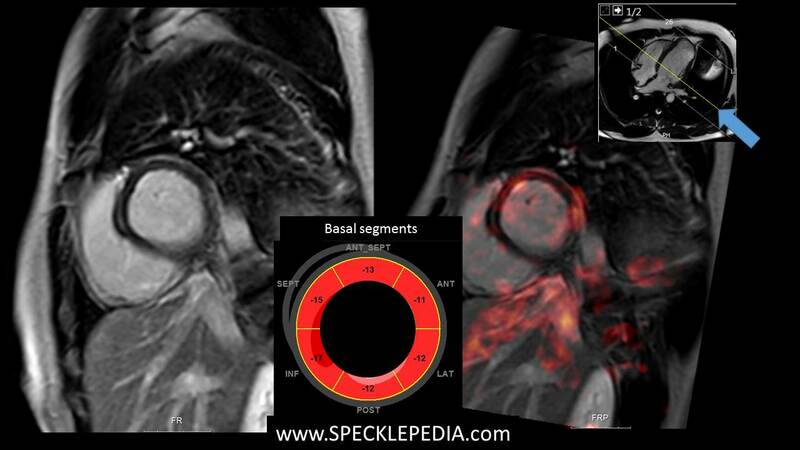 The Cardiac MRI delayed enhancement short axis images are shown on the left and the fusion images of the MRI and PET are shown on the right. I provided three slices: basal short axis, midventricular, and apical short axis. The corresponding longitudinal strain values are provided in the bulls-eye plot in the center. 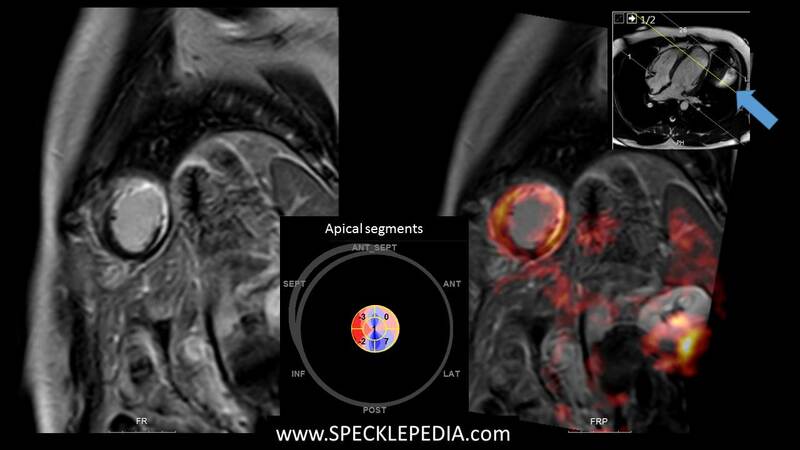 MRI showed transmural delayed enhancement apex (see MRI description above). The PET scan shows us activity in a very small region basal anteroseptal (at the site of delayed enhancement) wall, activity in the mid-posterolateral wall extending to the apical region. The apical cap did not show activity on pET (not shown). 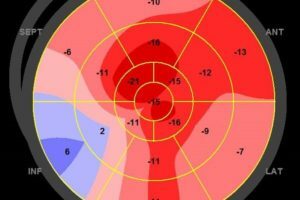 There is a close correlation between 1) the transmural scar in the apical cap and the positive strain values, 2) the activity on PET in the posterolateral region midventricular and the reduces peak strain values in these regions, and 3) relative normal values in the regions with no delayed enhancement and/or PET activity.